Discover the wonders of the plant kingdom in Scotland's Premier Garden. Plants from around the world are displayed in over 28 hectares of beautifully landscaped grounds. Featuring Britain's tallest Palm House - leads you on a trail of discovery through tropical and temperate regions of the world. See the cycads - plants from the time of the dinosaurs - spectacular exotics and everyday essentials. The world famous Rock Garden contains a wealth of botanical treasures - marsh orchids, lilies and campanulas to name a few. Wonderful blooms stretch along one of Britain's most impressive beech hedges. Stroll among the magnificent trees - oaks, limes, maples and rowans - and the colourful flowering plants. In autumn thousands of gentians form a sea of blue. A Chinese hillside - complete with wild water-ravine - in the middle of Edinburgh! Come and see the unrivalled collection of wild origin Chinese plants. You'll be surprised at how many you recognise! Highly scented, colourful azaleas and rhododendrons compete for your attention. 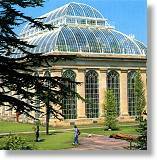 In a courtyard near the impressive Victorian Palm House is the famous alpine collection. Look out for gems like pleione, orchids, primulas and tulips. An inspirational tribute to a much-loved royal featuring an 18th century-style grotto. Demonstration Garden, great ideas for your garden at home. Guided Tours, The Garden's secret treasures revealed on an exciting walk with our expert staff, Daily at 11am and 2pm from April to September. John Hope Gateway visitor centre. No animals, except guide dogs, admitted. Entrances: East Gate [Inverleith Row] and West Gate [Arboretum Place]Off the A902, one mile north of the city centre. Regular bus services to the East Gate, Inverleith Row. On-street parking at the West Gate, Arboretum Place. Inverleith Botanic Luxury Studio Apt.